Baroness Grey-Thompson says she has attracted a stream of anti-disability abuse after she spoke of having to crawl off a train in London. 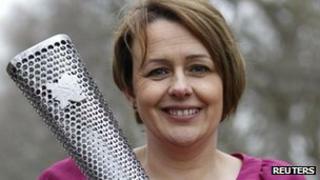 The former Paralympian said she was often left without assistance at stations despite advance requests. A newspaper website reporting the story prompted a large number of offensive comments about the peer's disability. "There's a lot of disabled people who wouldn't be able to deal with it the way I'm able to," she said. Lady Grey-Thompson, who was born with spina bifida, revealed she was recently left stranded at King's Cross station in London at midnight after travelling from her home in north east England. She said she had to shuffle onto the floor and push her wheelchair towards the door of the train. But the baroness told BBC Wales she was shocked by some of the abuse she attracted from people posting their views on a newspaper website which carried the story. "A couple of hundred people said some fairly unpleasant things about me along the lines of 'what gives her the right to speak, she should be at home, she shouldn't be out at midnight, she should be better organised', and what right did I think I had to travel on public transport. "The most offensive ones were more generic, like maybe there should be a cattle truck at the back of the train for wheelchair users so they can all sit together. Lady Grey-Thompson said she wasn't worried as much for herself as for other disabled people who faced prejudice. "I've got quite a thick skin but when you hear people talking like that in a very derogatory way about disabled people I find that quite worrying," she said. "There's a lot of disabled people who wouldn't be able to deal with it the way I'm able to deal with it. "The fact I'm in the House of Lords does give me a voice to say, hang on a minute, we need to do something different. "It's very worrying that there's this underlying cynicism about disabled people - and some of the posts were actually quite threatening." The gold medal-winning athlete said she recognised that the scope for anonymity on social media and the internet made young people in particular less polite. "I have had some fairly bad things said to my face," she said. "When I was pregnant someone in Queen Street in Cardiff said people like me shouldn't have children. "But I think people in a face to face situation tend to back down. "In something like Twitter and Facebook and other situations people forget and they think that there's some sort of security around themselves. "A lot of people do forget that it's public... even if you delete something, people can still keep a copy of what you said. "I do worry that a lot of young people forget how public some of this is."